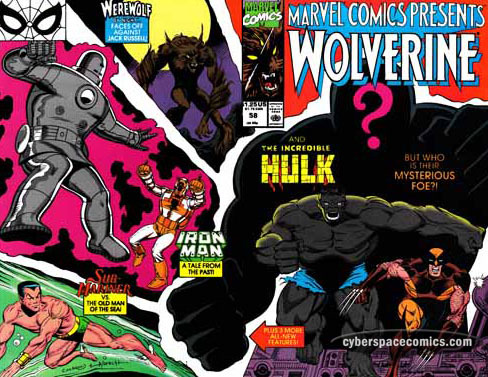 After a big battle between the Hulk and the imposter Wolverine, the copycat retreats and the gray behemoth is able to release the hostages. Later, the Hulk catches up with the villain and discovers his true identity – but is shocked by it, because he’s supposed to be dead! Bloody and beaten from his fight with the Braineaters, Werewolf By Night finds the nearest hole and crawls in to rest. And, as his body recuperates, his alter ego’s spirit has an out of body experience. Or is that in body experience? His consciousness and the wolf’s come to an agreement. Instead of this constant warring, they come together – Fusion. The Werewolf emerges from the desert cave healed and complete – for the first time! The Braineaters return for round two but, in a surprise attack, all of the werewolves are gunned down by the Silver Dagger and his strike force – the Sword of the Lord. Inside Neptune’s Eye, Namor and Sandra discover an underwater pocket of air – although “pocket” indicates a small area … but this is like a whole new world! After a minor disagreement separates them, an old man appears and grabs Namor’s attention. The mysterious man reveals he’s dying and the sea is reacting in turmoil – as are the strange creatures that reside in Neptune’s Eye. He gives Namor an amulet that is intended to serve as a sign to the humans to depart from the Eye – to keep them safe from it. After a guard fell asleep on the job, Iron Man was dispatched to a research lab to make sure it was still secure. But, an armored thief has broken in, overpowered Iron Man, and stolen the top-secret Energizing Module. Since knowledge of the Module was limited to a handful of people, Tony Stark suspects a traitor in his company so he charges Pepper Potts and Happy Hogan with the task of outing the turncoat. When Pepper turns up a lead, Iron Man jumps in to investigate and finds the villain (who he’s taken to calling the Neutralizer). Using his new technology, Iron Man is able to counteract the Neutralizer’s armor and reveal his true identity – someone on the Stark board! The Wolverine/Hulk feature plays to its strengths in this issue: battle and mystery. Just who is this mystery copycat villain? Hopefully it’s revealed soon. This new merger of man and beast presents some interesting opportunities for character growth – assuming the werewolf will survive the attack by the Silver Dagger! The old man in the Namor story has caught my interest – I hope they’ll delve into who he is in the next issue. And, finally, I was prepared to be totally turned off by Ditko’s Iron Man story but it was actually fun in a “Silver Age” way – it even takes place early on in Iron Man’s career (he’s in his Mark II armor).